Legionella pneumophila is the causative agent of Legionnaires’ disease. This bacterium was isolated in 1977 after a large outbreak of pneumonia stroke Philadelphia in 1976. L. pneumophila can be found in almost any man-made or natural water systems. In this environment, L. pneumophila infects and grows inside amoeba, unicellular animals that normally feed on bacteria. L. pneumophila is transmitted to humans by inhalation of contaminated aerosols. Once in the lungs, L. pneumophila is able to infect lung macrophages (Figure 1). Macrophages are cells of the immune systems whose role is to take up and digest invading pathogens. L. pneumophila is able to block the normal activity of the macrophage and use it as a bag of food. This results in the death of the infected macrophage. The infection also causes damage to the nearby lung tissues. In healthy individuals, the infection is cleared by the immune system and is usually asymptomatic, but sometimes symptoms similar to a mild cold may appear. In such case the infection is referred to as Pontiac’s fever. When the immune system of the person infected is unable to clear the infection, massive lung damage will result from it. This is what is called Legionnaires’ disease and the symptoms are similar to pneumonia, including headache, chest pain, fever, non-productive cough and diarrhea. 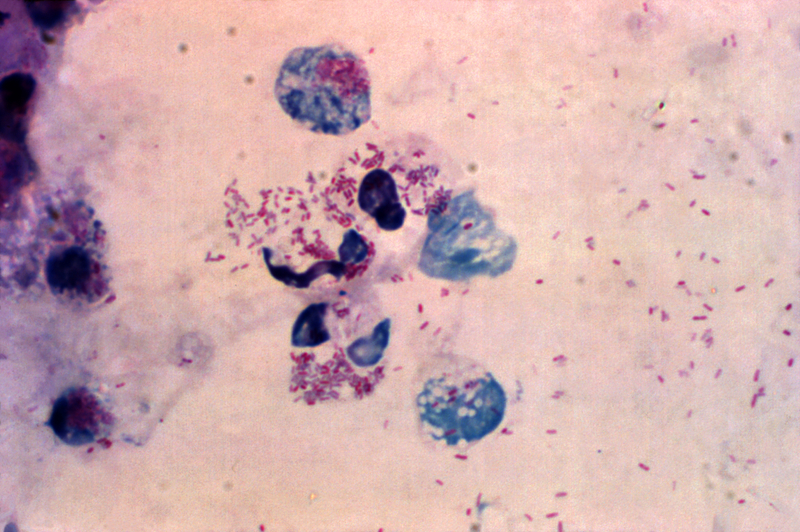 Figure 1: Microscopic image of fluid extracted from guinea pig infected with L. pneumophila stained with the Gimenez method. L. pneumophila cells are pink, host cells, such as macrophages are blue. Source: Public Health Image Library, Center for Disease Control, Dr. Joseph McDade (1978). The rate of confirmed Legionnaires’ disease in Ontario for 2008 is 0.61 per 100,000 people. Since the cause of most pneumonia cases is not investigated, the actual rate of the disease is probably much higher. In some European countries, L. pneumophila is now recognized as one of the most common cause of pneumonia. Elderly, males, heavy smokers, alcohol abusers and immunocompromised individuals are more susceptible to the disease. During outbreaks, the mortality rate is typically around 10%. Contaminated cooling towers located in densely populated area are usually the cause of outbreaks of Legionnaires’ disease, since many individuals are exposed to the aerosols produced. One notable outbreak is the 2012 Quebec City outbreak, which affected 183 persons, including 13 deaths. Sporadic cases also exist. They are usually caused by an isolated source, such as a contaminated domestic water heater. Therefore, only the members of the household where the contaminated unit is located are exposed to the contaminated aerosols, during showering for example. During bacterial lung infection, macrophages are called-in to eat and digest the bacteria. A macrophage picks up L. pneumophila by a process called phagocytosis. At this point L. pneumophila is located in a phagosome, a sort of bag, inside the macrophage (Figure 2a). Normally, bacteria that are taken up by a macrophage will be killed and digested. The macrophage accomplishes this by pumping toxic proteins and chemicals into the phagosome. The macrophage is protected from their toxicity because they are activated only once inside the phagosome. To the demise of the macrophages, L. pneumophila is able to fight back by inhibiting the digestion process of the macrophage. L. pneumophila uses a secretion system called Icm/Dot to take control of the macrophage. This system acts like a syringe to inject toxins through the wall of the phagososme inside the macrophage (Figure 2b). The toxins then modify the normal properties of the macrophage to stop the digestion process describe above by preventing the pumping of toxic enzymes and chemicals insto the phagosome. Moreover, the toxins stimulate the transport of nutrients into the phagosome to support the multiplication of L. pneumophila (Figure 2c). When the bacteria have consumed all the nutrients inside the macrophage, one of the toxin triggers the destruction of the macrophage allowing L. pneumophila to escape and infect other macrophages (Figure 2d). L. pneumophila also produces a number of proteases, enzymes that degrade proteins, which destroy the nearby tissue causing damage to the lungs. 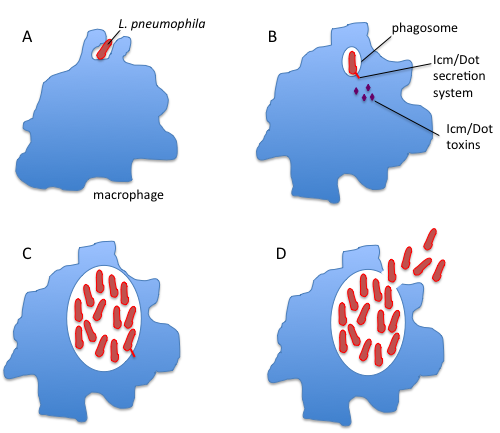 Figure 2: Infection of macrophage by L. pneumophila. A, phagocytosis; B, secretion of Icm/Dot toxins; C, growth inside the macrophage; D, destruction of the macrophage and exit. L. pneumophila is usually susceptible to antibiotics normally prescribed to fight pneumonia, such as azithromycin. This antibiotic stops the synthesis of proteins, such as the toxins secreted by the Icm/Dot system, neutralizing the ability of L. pneumophila to inhibit the digestion process of the macrophage. Since L. pneumophila causes damage to the lung tissues, early start of the antibiotic treatment usually means better chance of survival. Albert-Weissenberger, et al. (2006). Legionella pneumophila — a human pathogen that co-evolved with fresh water protozoa. Cell Mol Life Sci 64, 432–448. Diederen, B. M. W. (2008). Legionella spp. and Legionnaires’ disease. J Infect 56, 1–12. Fraser, D. W., et al. (1977). Legionnaires’ disease: description of an epidemic of pneumonia. N Engl J Med 297, 1189–1197. McDade, J. E., et al. (1977). Legionnaires’ disease: isolation of a bacterium and demonstration of its role in other respiratory disease. N Engl J Med 297, 1197–1203. Ng, V., et al. (2009). Laboratory-based evaluation of legionellosis epidemiology in Ontario, Canada, 1978 to 2006. BMC Infect Dis 9, 68. Marrie, T. J., Garay, J. R. & Weir, E. (2010). Legionellosis: Why should I test and report? Canadian Medical Association Journal 182, 1538–1542. This entry was posted in Uncategorized on August 13, 2015 by fauchersp.